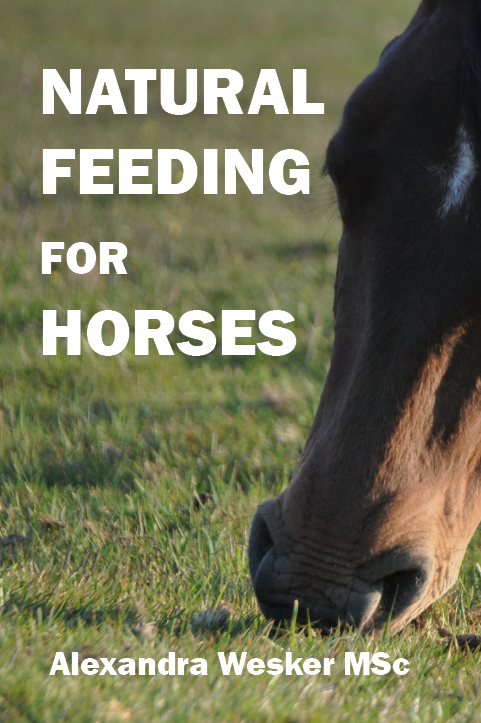 Mac wrote in regarding dehydration in horses: "Great article on dehydration in Horses and Humans. I know people can go a maximum of three days without water, so my questions are how much water does an average horse need for one day, how long can a horse go without water like in the heat of the summer, how can you get horses to drink more water?" While it is true that 48 to 72 hours is generally considered to be the maximum time a person can go without water there are several factors that would extend or reduce this timeline such as ambient temperature, exposure to the Sun and the individual's physical condition. But well before that individual would actually die from dehydration, his or her ability to think coherantly and physically function would be greatly reduced. At some point, likely hours, before actual death from dehydration if someone found the individual, he/she would likely be too far gone to save with oral re-hydration. So I think these questions are the revelant ones: 1 - How long can a person or horse go without water before their physical ability and mental reasoning is signifcantly degraded; 2 - At what point or time without water does an individual or horse become on a shortr spiral to death without extraordinaty life savings measures; 3 - then the question of how long can an indvidiaul or horse go without water before dying becomes kinda non-relevant. Someone sent me a chart or meme with a picture of a horse and a quote to the effect that horse's need eight gallons of water a day. I'm sure it was intended to make owners more aware of a horse's water needs, but eight gallons per horse per day is a minimal amount in my opinion, maybe excepting in cooler temperatures. I know of four horses that have traveled 60 miles in 50 to 70 degree weather with heavy loads - saddle and rider on one horse, and saddles with a hundred and fifty pounds of marijuana on the other three horses - all without access to water, and at the end of the second day, the rider leading the string rode into a ranch and asked the people there to call the Border Patrol. The rancher took care of the horse, giving them water before turning them over to the Tick Rider, and all horses survived. If the temperature would have been twenty degrees hotter, then this story would have likely had a different ending. Probably the closet I've came to testing one of my horses to his limit was chasing a someone's loose horse for 17 miles in over 100 degree temperature. Once I got my horse back to his pen he was more interested in feed than water, but once I had them cooled off, I'll give him a chance to drink for 30-45 minutes before feeding him. If he still has not drank and water, sometimes I'll soak some alfalfa in water and let him have that. And you asked about how to get a horse to drink more water? I'd like to know myself. But what I do if one of my horses is finished eating, and I'm waiting on him, I'll lead him over to the stock tank. If I'm patient enough, he'll usually drink a little which makes me feel better about taking him out for some work. In some cases if I'm needing to get him to work, I'll give him water soaked hay, like I mentioned above. All horses are going to be a little different, watch them for a few hours and you can see what their tendencies are. 1430 back home in the pen, offered water, horse drank maybe 1/2 gallon. I did a skin fold test - skin on neck stayed tented for 5-6 seconds indicating pretty well dehyrdated. I hosed him off with cool water then put him back in his pen. The pictures at right show the skin fold test on the loose skin on his neck. 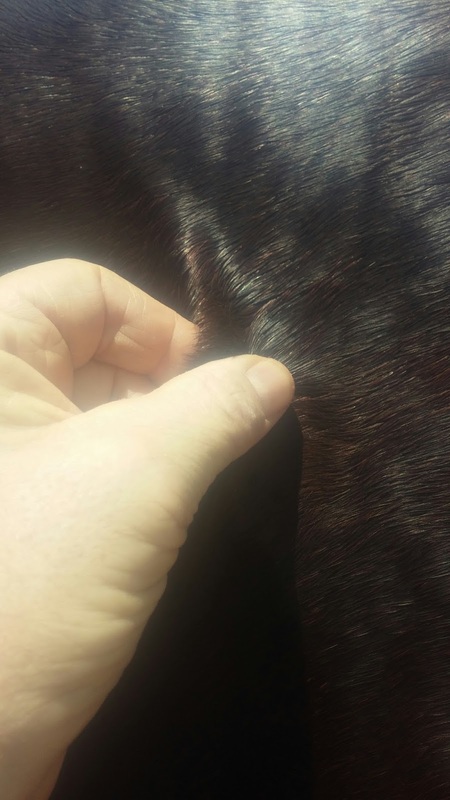 Sorry about the poor quality picture at bottom, but I think you can see the skin staying "tented" which is a pretty good indication that he is dehydrated to some extent. 0830 He had drank another gallon. I saddled him and rode about 5 miles in 90 degree heat and direct sunlight. 1100 He was back in his pen and I did another skin fold test with his skin staying tented for less than 2 seconds. So I left him to drink and wait until his mid-day feeding. By 1800 He drank 5 more gallons of waters. 1800 to midnight, he drank maybe 1 more gallon of water. So in two days, in day temperatures over 100 degrees with moderate work, this horse drank just a little more than 27 gallons of water. Providing adequate amounts of clean water for horses is likely the biggest failure of most people I see keeping their horses in pens. Getting asked to look at suspected horse abuse I most often see horses without adequate water at all. I advise owners that they should plan on their horses needing 15 gallons of water, per horse, per day at a minimum. This is pretty consistent with my two days of measuring on one of my horses. 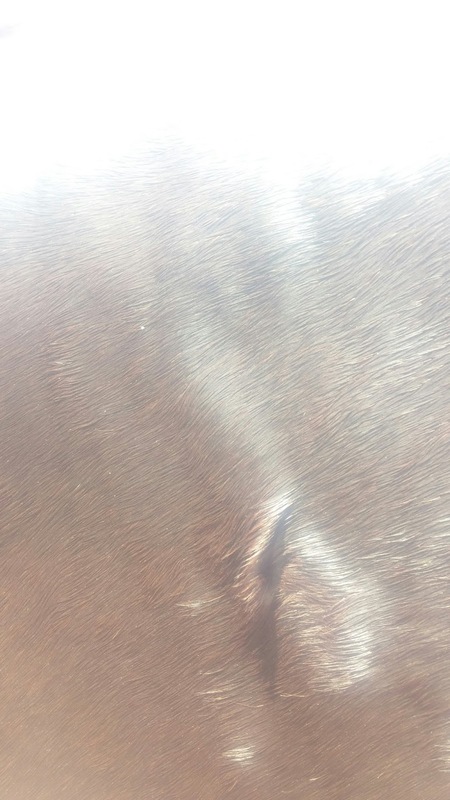 All my horses have overhead cover to protect them from the direct Sun if they seek it. Many horses are kept in facilities without over head cover so I would think their water needs may be greater.